I'm juggling a lot of WiPs lately, but my priority right now is a project I'm putting together for Quilting for Calgary. Most of the pink fabrics in this quilt were generously donated for the cause and I had a great time turning them into something modern. I am typically not a huge bubblegum girl so this has been an amazing way to break out of my safe zone. Together with a few red-pink fabrics from my stash and a whole lot of gray prints, this quilt has really developed into something fun. The donated fabrics were cut into 3.5" WOF strips, so I knew right away I wanted to come up with a pattern that would maximize their size. While debating my options, an amazing large scale plus quilt by Leanne (from She Can Quilt) hit my bloglovin' feed and I knew it was a perfect pattern choice. Last night I made the backing and spray basted the layers. I'm hoping to toss in a few pins tonight and then get quilting ASAP! I am super excited to quilt this because I'm going to try a new FMQ technique, and also because I just splurged on a new Janome 8200 - eek! Here's a quick peak at my two Janomes side by side (4100 and 8200 models respectively). I apologize for the poor lighting in the evening shot but I swear this photo serves a purpose. Since I do the majority of my sewing in the evenings, I am especially excited about all of the LED lights that this new machine has. Between that and the 11" throat space I am absolutely smitten. Everything beyond that is absolute icing on the cake and I am so beyond thrilled. Now I hope that you can excuse me while I skip my way back to my sewing room. OMG my jaw dropped looking at the size of the new machine in comparison. Good pic. You go girl! 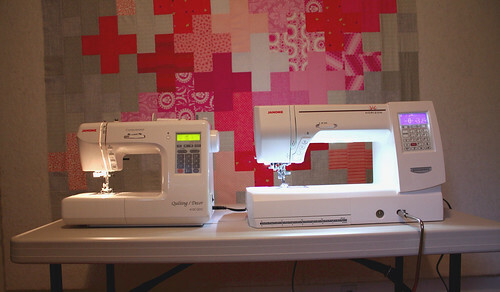 Quilting is going to be amazing on that daddy machine. I really do like your pinks with grey plusses. I Especially love the little runaway in the top left hanging by himself - so cute. Would love to hear how it goes with the new machine. It looks fantastic Kelsey. I love the varied background fabrics too. What quilting did you decide on? I really really love this quilt! Surprising given that I am not a huge pink fan either. Wow, your new machine is enormous! 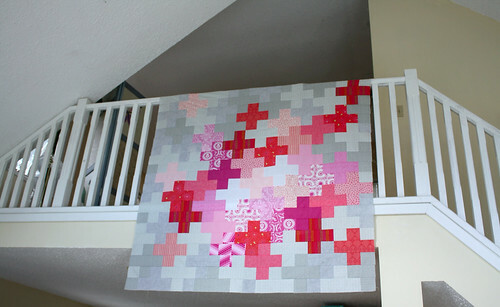 It looks amazing to quilt on - can't wait to see how this one turns out. I love the quilt. The way you placed the colours really makes them pop. Great job! Positively perfect! And holy wow, nice new machine! Can't wait to see how you quilt this one up! 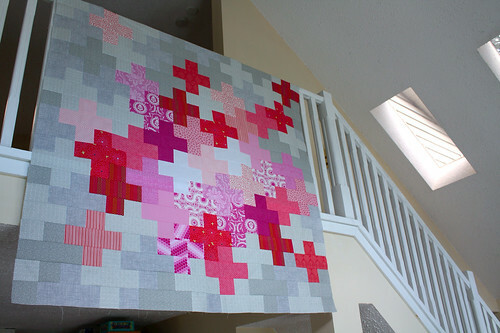 Really lovely quilt, the grey stops it being a sickly pink, just looks nice and modern. And Oh, gorgeous new machine. Let us know how the quilting goes. Have fun. I love this quilt! And congrats on the new machine! Love this quilt! And the way you arranged the fabrics is just perfect. Can't wait to see what you do on that machine. Love all that room! I just treated myself to this machine too - mainly for the 11 inches! Have you tried the dual feed foot yet? Amazing. Love that quilt! 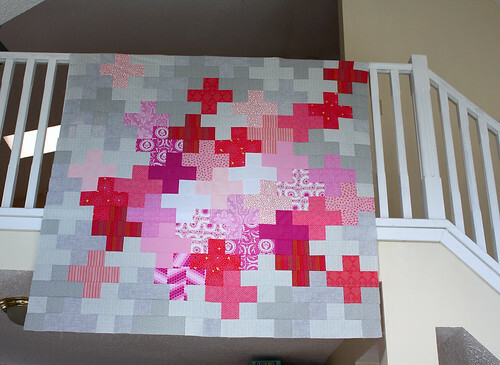 I like plus quilts to begin with, but your layout and colors (pinks, reds, greys) is really striking! I have a janome 6500, and wish it had better lighting, so I am getting a LED lighting strip to put under the throat. Your quilt turned out so wonderfully, I love it!